Thanks for choosing the Osaka Evening Food and Drink Tour! We'll meet in front of the McDonald's that is just outside the fare gates to JR Tenma (sometimes spelled "Temma") Station. Note that depending where you are staying, it may be easier to ride the subway to Ogimachi Station and then walk the few short minutes to Tenma Station. Legal drinking age in Japan is 20 years. Customers booked as adults (20 and over for this tour) will not be served alcohol. Kevin showed us a range of eating styles, incl. the Stand and Drink restaurant, which we wouldn’t have tried without his help. He judged our palate really well and ordered accordingly. We really liked the oyster and egg soup in the very cosy bar. It was a delicacy we had never tried before. He gave us an insight into Japanese culture through Western eyes, incl. Pachinko parlour and Love Hotel. We highly recommend booking a Food and Drink tour in Osaka. Worst "food tour" I've ever been on. Only reason it gets 2 stars instead of 1 is that there was actually food.First hour of the three-hour tour the guide had us awkwardly wander around to kill time before our reservation. 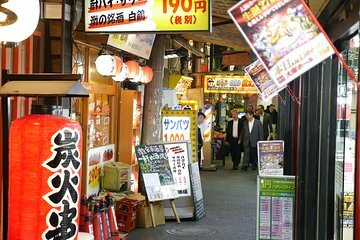 Instead of spending this time getting snacks from a street vendor or teaching us about Osaka's culinary history, he showed us a pachinko hall and love hotel and pointed out prostitutes.Tour did not teach us about Japanese cuisine like you'd expect from a food tour. Guide didn't even tell us WHAT we were eating half the time, much less anything about the dish's history. Tour guide also tricked us into eating whale without telling us what it was until afterwards. He may not have a problem with eating whale but many MANY people have moral objections and I am livid that we couldn't make that choice on our own! One of the best tours I have ever taken. My son and I were the only ones on the tour, due to another group cancelling. Our guide, the owner of the company, knew Osaka inside and out. As an American from the Bay Area, he was great at comparing and contrasting the Osaka people from their counterparts in Tokyo, as well as we Americans. The tour made several stops in markets and stores, as well as stops for food and drink. The owners of the restaurants knew our guide as well, obviously sharing a close relationship, for quite some time. All of the stops for food and drink were great, and we did not want for anything else to after the tour. I can't recommend this group enough, and plan to take another tour when I return at the end of the year. We got to visit restaurants we wouldn't have known about except for our guide. We had a great variety of food for both the adventurous and the not-so-adventurous eaters. The price includes plenty of food and drink so you probably won't need to spend extra. One of the surprises of the tour was that it also included fun cultural tidbits and local colour above and beyond food. We did this tour our first night in Osaka and it set the stage for a great time in the city. Kevin Boynton knows his stuff....and he makes this evening food and drink tour one of the best tours I have booked by Viator. I booked about 5 food and drink tours. None compare to Kevin's knowledge of Osaka and of Japanese cuisine and liquors! I think it always helps when you enjoy the company of those on the tour, as well. 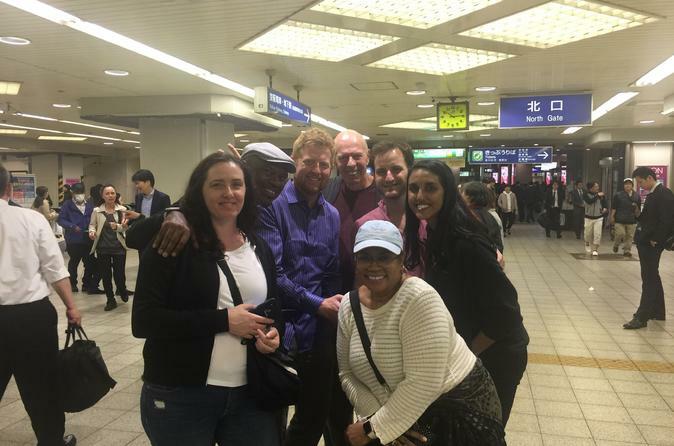 This group was fun and we went to places you wouldn't find unless one knows Osaka...this is a must do ..and it should be on the front end of your stay in Osaka. A treat was a Suntory and Nikka tasting...what fun and so educating. Many thanks, Kevin! The tour was really interesting with an English speaking guide who has lived in Osaka for many years. We got to try a variety of local delicacies in local restaurants that we wouldn't normally have tried which added to the experience. This was more than just a food and drink tour with our guide explaining about other parts of modern Japanese culture helping to build a bigger picture. Be prepared to stand while dining like the Japanese do. Absolutely brilliant evening. Very entertaining and experienced guide, small group, and some amazing food to try. Dylan took us to some great food spots in Osaka that I would never have came across or tried without his help and guidance! I also appreciated how he depicted Osaka and just Japan itself with it’s pros and cons, giving a true picture of the culture. Fun experience. Unexpected sites and eateries. Our tour guide was delightful. A great way of enjoying the Japanese local culture. Highly recommended to anyone who want to try the true local delicacies in Osaka.